Delegates in Aberdeen were treated to a successful inaugural lecture on Wednesday night. Dr. Catriona Kennedy, experienced nurse and researcher, delivered her inaugural professorial lecture having recently been appointed QNIS Chair in Community Nursing at Robert Gordon University. Among her many key messages, she was keen to highlight the central importance of anticipatory care at the heart of community nursing. Professor Kennedy drew on research which illustrated both the meaning and impact of anticipatory care of patients and family carers. Anticipatory care is the ability to look ahead and forward plan care. Professor Kennedy suggested that the ability to anticipate the care needs of patients and families is a hallmark of professional practice and gave a glimpse of how we can prepare future nurses and midwives. Professor Kennedy joined the university’s School of Nursing and Midwifery earlier this year, with a remit to build the university’s research capacity and capability in nursing and midwifery. Professor Kennedy worked as a district nurse for a number of years, before moving into education at Queen Margaret University, where she took up post as the Queen’s Nursing Institute Scotland Advanced Practitioner and Lecturer in District Nursing. She then went on to work with Marie Curie Cancer Care, Edinburgh’s Napier University and the University of Limerick. Since completing her PhD in 2000, she has conducted wide-spread nursing practice and community focused research. Her new post at RGU has been partially funded by the Queen’s Nursing Institute Scotland. We at the QNIS were delighted with the lecture, and how well it was received by the audience. 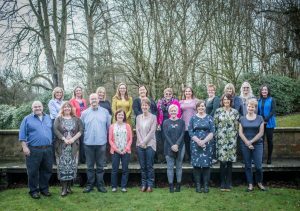 We are looking forward to working further with Catriona and the team at RGU to deliver community nursing research capacity. 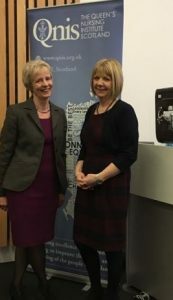 Clare Cable, pictured above (left) with Catriona said: “We are very pleased to be working alongside such an experienced researcher, whose commitment to promoting excellence in nursing care in Scotland’s communities is clearly evident. QNIS is honoured to be supporting this Chair in Community Nursing. Keep an eye on our website for a video edit of the conference, and a blog on the content from Scotland’s Lead on Anticipatory Care.